A portion of the ramp from 71/470 highways to westbound I-435 collapsed into a sink hole on Saturday afternoon, causing the heavily traveled roadway to be closed potentially until autumn. Officials at the Missouri Department of Transportation (MoDOT) said that on July 8th, highway engineers inspected the roadway following more than two months of frequent rain. They noticed cracked concrete pavement and nearby ground settlement, and closed the right lane of the ramp. By Saturday afternoon, however, the sink hole had grown. The right lane and a portion of the retaining wall collapsed, taking with it a massive street light. Soil and geology specialists from MoDOT worked Monday to take soil core samples where the road collapsed. Analyzing the results of the work will help engineers determine how to safely remove sections of the roadway and retaining wall, according to District Engineer, Beth Wright. Preliminary finding from the geology study should be complete by mid-week. Wright says that MoDOT plans to have a contract in place to begin the demolition work by the end of this week. In addition MoDOT plans to have a contract finalized with engineering firm HNTB to design the repair to the roadway by the end of the week. 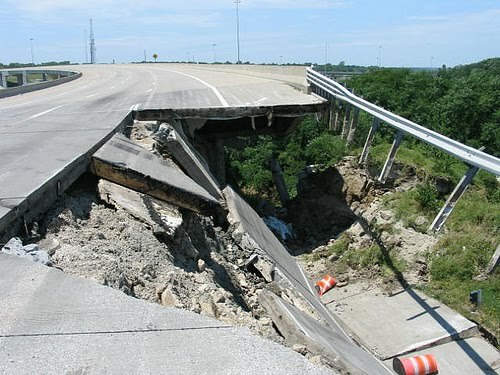 “MoDOT plans to move quickly to stabilize, then repair the roadway. By the end of this week we should have an idea of what it will take to repair it,” Wright added. While the timeline is still uncertain, Wright hopes to have the roadway repaired and open by early fall. In the meantime, thousands of motorists who use the 3-Trails Crossing interchange are facing detours and increased travel times attempting to reach westbound I-435 without the roadway. Traffic volumes in this area range between 67,000 and 88,000 vehicles a day. Some help comes from the construction along 87th Street. Drivers are able to take I-435 north to the 87th Street exit, which is closed off in a way that allows motorists to turn back around and get onto I-435 south without stopping. From there, drivers can access westbound I-435 as normal. Other detours are also posted. To help with detours, MoDOT created a website on www.modot.org/kc, which includes each detour for the major traffic flow from the area. The site includes directions, maps and google mapping tools. Wright also reminds drivers that the signed detours are not the only option. Research all routes available to you. The signed detours may not be the most convenient based on individual commutes.